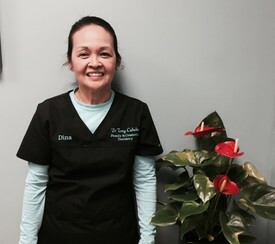 Dina has been in the dental profession for nearly 15 years. She is certified as a Registered Dental Assistant and has a wealth of experience to assist Dr. Cabebe with every aspect of patient treatment. Dina is married and has two adult children. 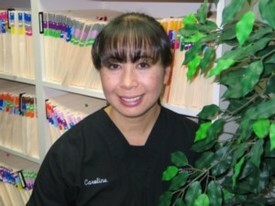 Caroline has over 20 years of experience in the dental profession. She started her career as a dental assistant then progressed into the patient coordinator position. Caroline is fully cross trained and can assist Dr. Cabebe with clinical procedures and does an excellent job with scheduling appointments and making financial arrangements with all patients. She is able to work with the various insurance plans available and can coordinate a patient’s insurance benefits.